Step 1: Make yourself at home. 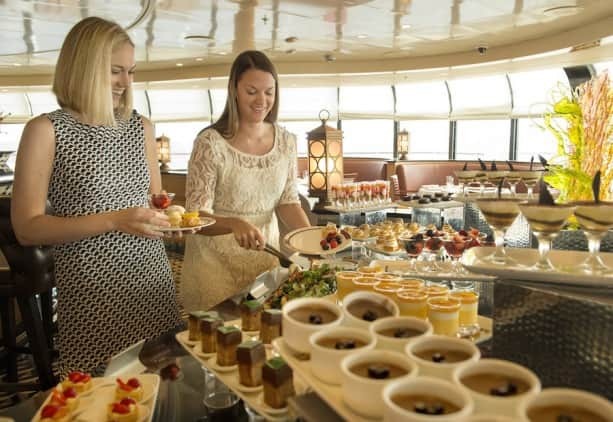 Our family-sized staterooms are also ideal for a group of friends. Connecting doors adjoin some staterooms, and the partition between the verandahs can be opened to create a larger shared balcony. Plus, getting ready for a night out is made easy with our signature bath-and-a-half design. Conveniently, one bathroom includes a vanity, sink and full tub or shower, while the “half” bath has a vanity, sink and commode. Step 2: Sit back and relax. Once you’ve settled in, it’s time to unwind. At the adults-only Quiet Cove Pool, you and the girls can soak up the sun, cool off in the refreshing pool and enjoy a beverage at the poolside bar. Or kick back behind a gently falling rain curtain at the adult-exclusive Satellite Falls on the Disney Fantasy and Disney Dream. For the ultimate relaxation, head over to our indulgent spa and the Rainforest room where you can unwind with tropical aromatherapy and melt your stress away on heated chaise lounges. Step 3: Sleep in and sip up. When the morning sun peeks in, roll over and smile … you’re on vacation! You deserve some extra time spent wrapped in luxurious Egyptian cotton bed linens with your head on a plush queen-sized pillow. And when you’re ready to venture out, meet the girls at Cove Café, a peaceful adult-exclusive retreat where you can sip a gourmet coffee and chat about yesterday’s adventures. Step 4: Pamper your senses. 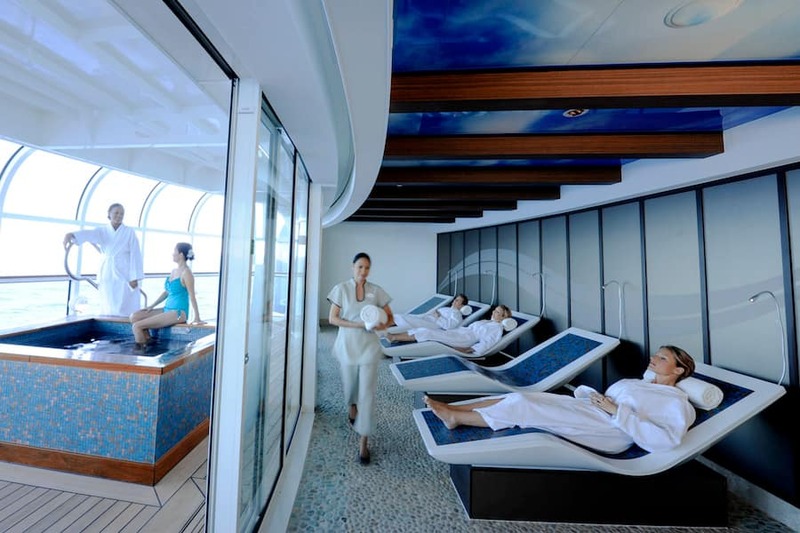 The spa is your go-to for a beautiful ocean-view environment where you can let your worries set sail. With a number of luxurious treatments and services such as massage, body wraps and facials, you and your girlfriends may just want to spend the entire day in this peaceful escape. On Castaway Cay, getting a therapeutic massage in a private, ocean-view cabana is a must-do. Step 5: Sharpen your skills. What’s better girlfriend bonding than taking a skill-sharpening class together? During “Anyone Can Cook,” you can learn the secrets of great cooking and get tips for creating everything from dazzling desserts to delectable entrées. Or, for you wine connoisseurs, try the “From Stem to Stern” wine tasting, where you can learn to sip like a pro by meeting with a sommelier and sampling wines from around the world. Step 6: Keep your fitness afloat. If you and the girls are in the habit of staying fit – even while on vacation – you can team-up to work out in the fitness center, take a jog on the track, or attend a group class like yoga or spinning. 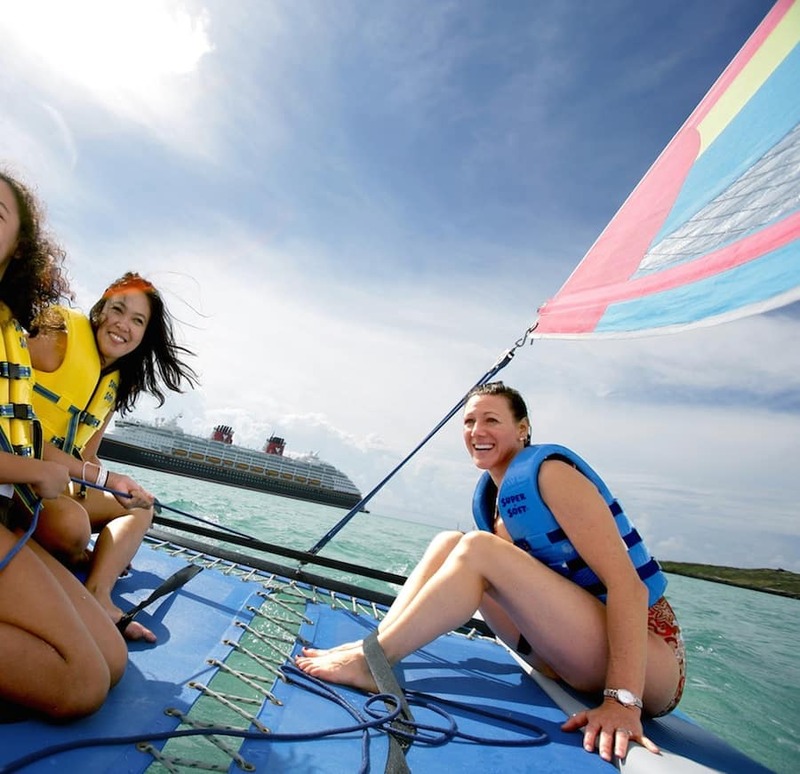 On land, a morning 5K run around Castaway Cay is a great way to explore the island together while burning some calories! 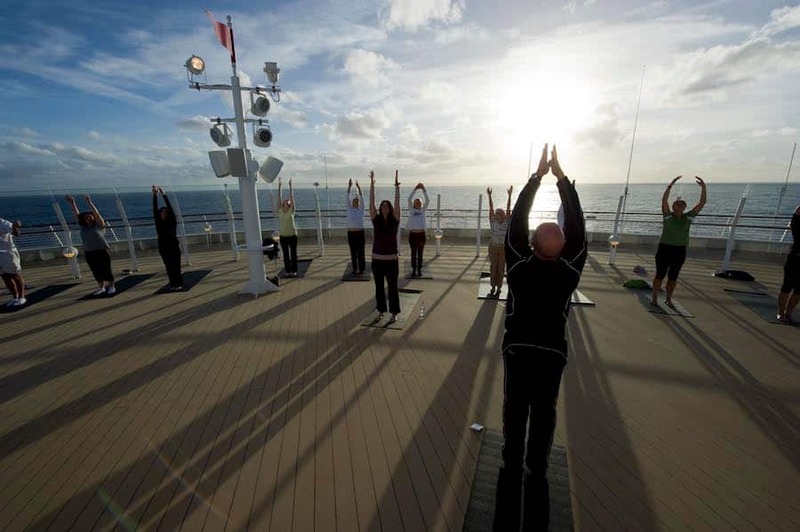 Later, fine-tune your vinyasa on the beach during a yoga class just steps away from the crystal clear water. Step 7: Have fun in the sun. Get your adrenaline pumping with a giant twisting, turning water slide up on deck, or challenge one another to a game of miniature golf, foosball or basketball. If your group is particularly adventurous, try parasailing, paddleboarding, kayaking or sailing at Castaway Cay, and be sure to take the plunge down the island’s Pelican Plunge water slide. Step 8: Dine like a queen. Foodies, rejoice! Top-notch cuisine and treats are never far away on your Disney cruise. At Palo, one of our adult-exclusive restaurants, you and your girlfriends are invited for brunch or dinner to indulge in a menu of delectable Northern Italian cuisine, classic reserve wines and superior service. And be sure to try Palo’s signature Chocolate Soufflé, served with decadent vanilla bean and chocolate sauces. Need I say more? Step 9: Shop ‘til you drop. For those ladies who love to shop, our onboard stores do not disappoint. 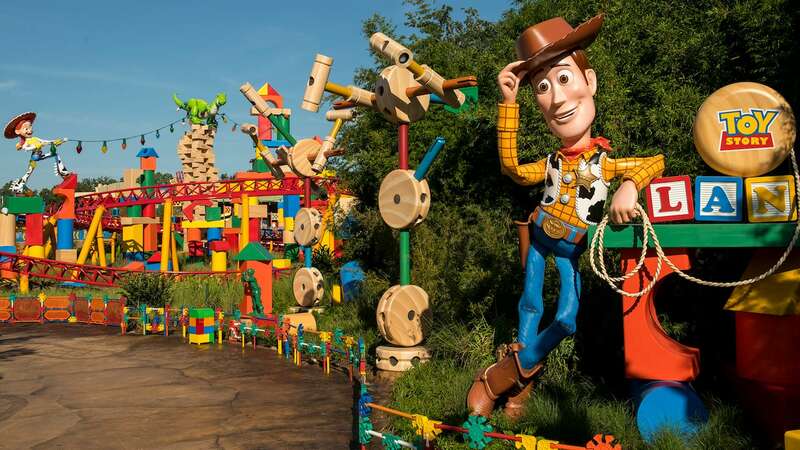 Everyone in your group can pick up souvenirs, clothing, jewelry, perfume and other specialty items, including Dooney & Bourke’s exclusive Disney collection. On Castaway Cay, you’ll find exclusive beachwear, hats, pins and more at She Sells Sea Shells … and Everything Else! Step 10: Toast to a night to remember. After a full day at the spa or sunbathing on deck, gather the girls for a fun night out at the adult-exclusive lounges. Inspired by an elegant French boudoir, Ooh La La on the Disney Fantasy is the perfect venue for a glass of wine before a night of dancing. 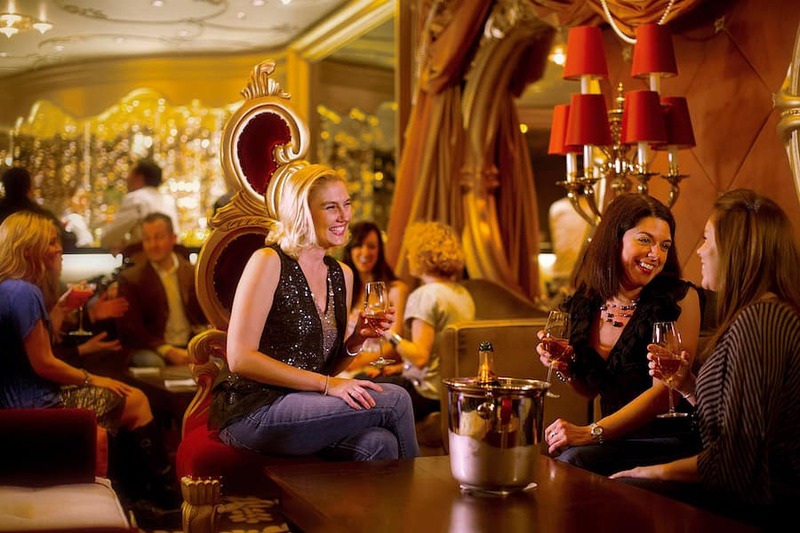 Or on the Disney Dream, try Pink, an elegant and upscale cocktail bar, serving top-shelf wines and liquor, as well as the bubbly beverage of choice … Champagne. Cheers to an amazing getaway, girls! Silly question….are the food items available in the Cove Café extra charge? I remember drinks being extra, but didn’t know about the food. Thanks! 18 days left until on the Dream!